Butler's account of his mission to the Red River Settlement forms a part of his book The Great Lone Land published in 1872. With the transfer of Rupert's Land to Canada trouble broke out in 1869 at Red River. Alarmed by rumours that their land might be taken from them, the French Metis, the "New Nation", defied the Canadian surveyors, kept the proposed Lieutenant-Governor from entering the Red River Settlement, seized Upper Fort Garry and set up a Provisional Government. The leader of the Metis was Louis Riel, a young man of ability and determination. The Canadian group in the Settlement opposed him but gave way to superior force and many were imprisoned in Fort Garry. To restore order a military expedition was sent under Colonel Garnet Wolseley. In his advance command, was the 60th Rifle or Royal American Regiment, with proud traditions, and following these regular soldiers were volunteer battalions from Ontario and Quebec. After reaching Fort William, their route lay through most difficult country; rock-fringed lake, swamp and forest. News of the projected expedition reached Lieutenant William Francis Butler, an Irishman of thirty-one years, when his fortunes were at low ebb. At twenty he had joined the 69th Regiment as an ensign, had seen service in Burma and Madras and, in 1867, had gone to Canada because of threatened Fenian raids and had hunted buffalo in Nebraska on "the glorious prairies". In that year, he had met and come to admire Wolseley. On 8 April 1870, he heard of the Red River Expedition and forthwith sent the following cable to Wolseley, "Remember Butler, Sixty Ninth Regiment". Then he drove to the London office of the Cunard Company and booked passage on the Samaria. On 4 May, the Samaria left Queenston, Ireland, now Cobh, for Boston. On arrival he hastened to Toronto where the Red River Expedition was mustering. The Commander said the whole army in Canada wanted to join the expedition and there was no vacant berth. Butler suggested that there was no one to give intelligence of what was being done in Minnesota and along the flank of the march. The Commander agreed but said that approval must be obtained from Ottawa. It was not till June 8 that the General at Montreal gave him final orders: "I will not ask you to visit Fort Garry, but, if you find it feasible, drop down the Red River and join Wolseley before he gets to the place. You know what I want, but how to do it I will leave altogether to yourself." On 13 June, dressed as a civilian, he left Toronto for St. Paul where he had to arrange supply for the troops during the coming winter in Red River. From St. Paul he travelled to Sauk Rapids and St. Cloud. From this point a four-horse stagecoach ran to Fort Abercrombie but three hundred miles still intervened before Fort Garry could be reached. He resolved to ride the whole way and was trying to buy a horse when he heard that the steamer International was on her way down the Red. After a night ride on horseback rendered almost unbearable by mosquitoes he found the International. From the top deck next morning he could see two Metis horsemen hastening to Fort Garry to carry word of his coming to Riel. Butler determined, if necessary, to shoot his way through on landing but Mr. Drever, a passenger on the steamer, who lived in Winnipeg and opposed Riel, gave other advice. Drever suggested that as the steamer turned from the Red into the Assiniboine the bow would momentarily touch the bank and an active man could jump ashore and avoid Fort Garry. He was then to pass through Winnipeg till he came to a bridge where Drever would have a horse ready. Butler was tall and very strong. Armed with a fourteen-shot repeating carbine and a Colt six-shooter, and accompanied by his dog, he was a dangerous opponent. The lights were shining at the landing stage two hundred yards away where Riel was waiting at eleven at night. The moment came and Butler leaped ashore. Making his way in the darkness through the little village of Winnipeg around Portage and Main, he came to a creek near the present City Hall. On the bridge was a guard but the Lieutenant marched past him without a word. 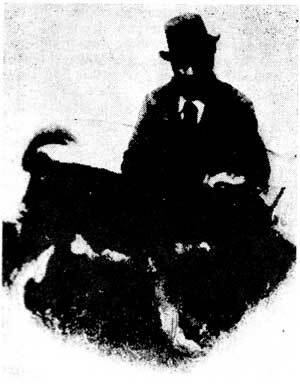 The dog, which had been released from his chain, bounded away and failed to return at his whistle. No horse could be seen so Butler strode on. By early morning, he reached the stone rectory at St. Andrew's. The awakened rector gave him a warm welcome and drove him to the Lower Fort. After a brief two hours sleep, he was wakened by the Hudson's Bay Company postmaster who advised him that the Indian settlement eight miles north presided over by Archdeacon Abraham Cowley would be a safer place. A hearty breakfast of mutton chops and Souchong tea at the fort gave him new life and he made his way to the settlement at St. Peter's where the Indians under Henry Prince, son of Peguis, Chief of the Swampy Crees, welcomed him with speeches of loyalty to the Great White Mother. Butler intended to leave by canoe to meet Wolseley's Expedition but an invitation came to visit the Upper Fort. Against advice he went there on 23 July and in "the dirty ill-kept fort" he met Riel, the President of the Provisional Government. Here is the pen portrait: "a short stout man with a large head, a sallow puffy face, a sharp, restless intelligent eye, a square-cut massive forehead overhung by a mass of long and thickly clustering hair, and marked with well cut eyebrows  altogether a remarkable looking face." After a few remarks, Butler handed Riel a letter which Bishop Tache of St. Boniface had given him when they had met at St. Paul. Riel read it, asked several questions about the present position and size of the Expedition but did not raise the question of amnesty for him and his followers. Riel then ended the discussion thus: "Had I been your enemy you would have known it before. I heard you would not visit me, and although I felt humiliated I came to show you my pacific intentions." Leaving the Fort, Butler made his way to the Lower Fort, embarked in a canoe, stopped to shake hands with Prince at St. Peter's, then pushed off for Lake Winnipeg and the Winnipeg River. The wild beauty of the river and the skill and daring of the voyageurs in piloting the frail birch bark canoe through the rapids appealed strongly to the young soldier. They passed through Lake of the Woods to Rainy River, 400 miles by canoe from Fort Garry, and at the foot of the rapids where the river falls into Rainy Lake, they spied the leading canoe of the Expedition. He met again Colonel Wolseley, a man young in years but old in service, fitted for command by energy, perseverance, professional training and natural aptitude for leadership. The Expedition made its way by the old fur trade route to the Red River, and disembarked at Point Douglas on the morning of 24 August. Over the rain-soaked, desolate prairie they marched with two brass guns trundling behind Red River carts. They drew near Fort Garry but there was no sign of occupation. The north gate, now the only remaining part of the fort, was closed but the one facing the Assiniboine was open. Riel had hastily departed  his breakfast still on the table. The Union Jack was again hoisted on the flagpole and a royal salute of twenty-one guns was fired from the battery. The Provisional Government had ceased to be. Here one must pause. The mission was accomplished but other duties, responsibilities and honours lay before the gallant soldier. Of these something may be said later.